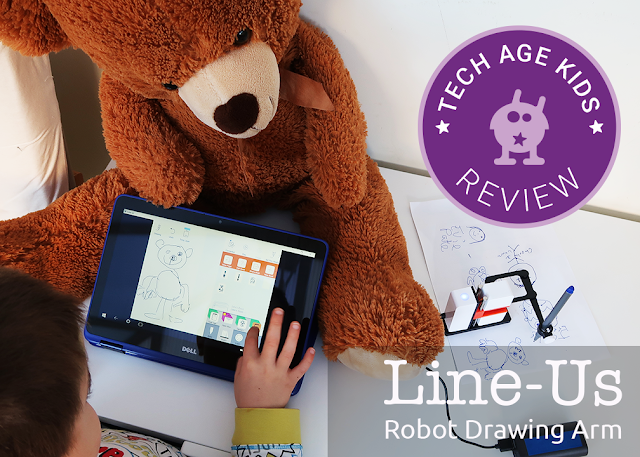 We were very excited last week when we received our Kickstarter reward - Line-us the drawing robot arm. We backed the campaign of designer and engineering team, Durrell Bishop and Robert Poll in March 2017 and patiently followed their journey. Line-us is a little robot drawing arm that you can use to play, draw and tinker! 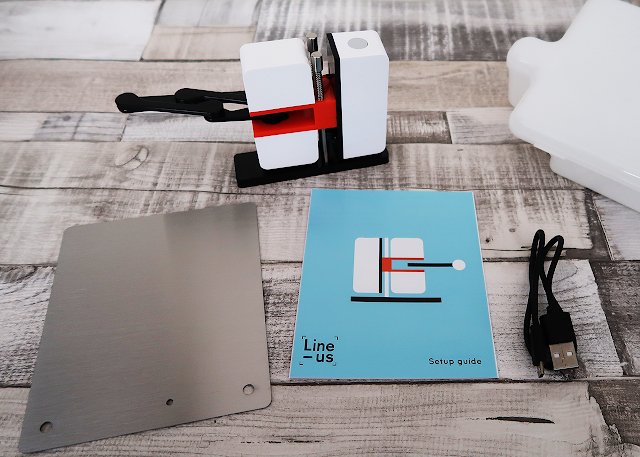 The Line-us drawing machine comes in a plastic box for easy storage and carrying around. It's small enough to fit in a handbag/backpack to take to a friend's house. The drawing machine comes with a USB cable but you need to add the power source. The easiest option is to use a powerbank to power the drawing machine. We have one with suckers, which is convenient for vertical placements on Line-us. You also get a metal plate which helps to keep the drawing arm stable whilst it is drawing. 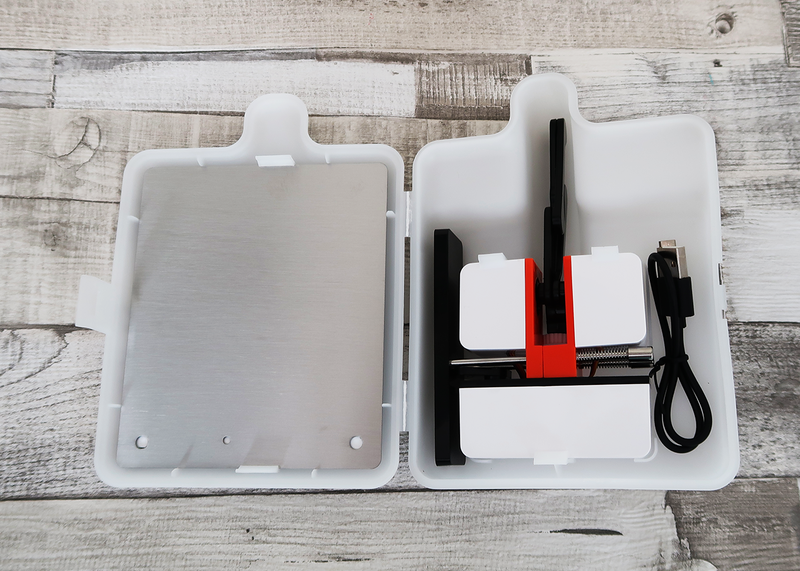 There are strong magnets on the underside of the machine so it can be attached vertically to a metal whiteboard or fridge. The arm attachment can fit a number of different drawing tools, like pencils, pens, sharpies and even paintbrushes. There's no assembly required and Line-us is ready to use straight out the box - after you've downloaded an app AND connected it to the WiFi. At first, we really struggled to connect Line-us to the WiFi but then discovered Line-us only works with our 2.4GHz WiFi connection (we also have 5GHz). The app and Line-Us need to be connected to the 2.4GHz WiFi connection. Once we established the connection it has worked ever since. 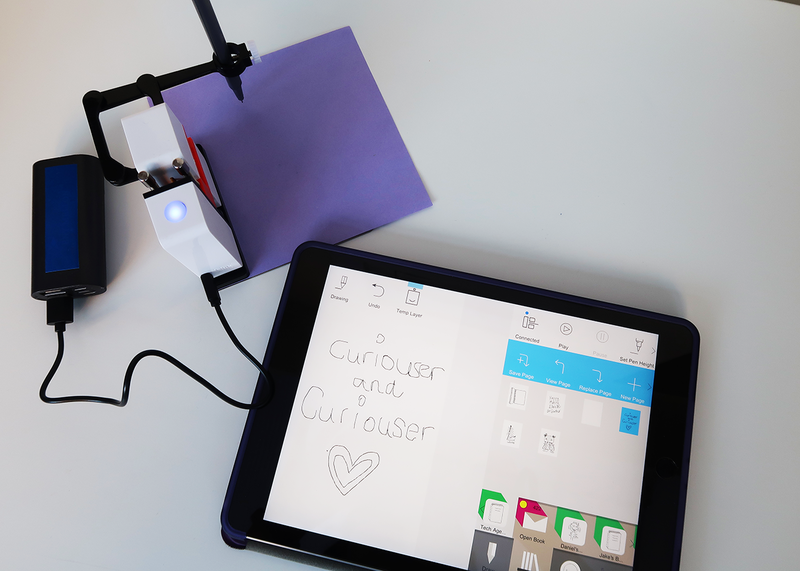 The drawing arm works via a simple drawing app which connects to Line-us via a WiFi connection. The app is available for iOS and Andriod devices and from the Mac and Windows App stores. We used Line-us with our iPad Air 2 and my son's Dell Inspiron touchscreen laptop via the Windows App. The Windows App on the touchscreen laptop worked great. It also meant the kids could get on with using Line-us without having to use my iPad. I created an account and used the same account for both apps. This meant the drawings sync'ed across the devices. We could also print from the laptop and then the iPad seamlessly. It's not the best drawing app, but then they have just launched and there is lots of scope for improvement. I think it would be easier to draw more detailed drawings with a digital pen on a tablet. My kids have quite a lot of experience using drawing apps but they didn't find the drawing part of the Line-us app as intuitive. There are a few quirks. 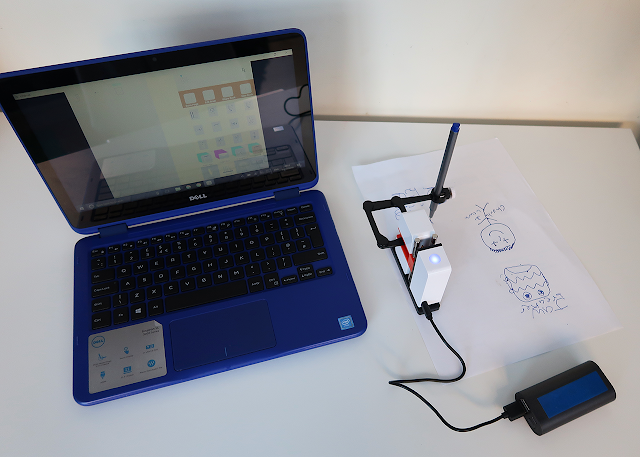 Once you've send the drawing and stop mid-way, the robot will start drawing from the beginning. Alternatively you could pause the drawing, however my kids kept stopping it instead of pausing. You can also not add to your drawing once the robot has finished drawing it. When you press 'play' the robot draws everything again. There's a merge layer which allows you to concentrate on one area, but when you merge the layer you can't 'unmerge' it. Definitely, use the 'set pen height' function before you start drawing to get the best results. When Line-us is not drawing the pen nib should not be touching the paper! The app also allows you to take a picture and then you can draw over it. Line-us will only draw the lines, you've drawn and not the photo! I love that Line-us is just a fun little robot that makes pretty things. Robots are mostly used for useful things or to make a task easier or quicker, but Line-us has a slightly different purpose. It's actually really fun watching the robot arm draw! The kids have loved playing with Line-us and confidently use the app and setup the machine to enjoy some creative screentime. They even got their friends involved on a playdate. I created a 'book' in the app for each child so they can keep their drawings together. You can also draw other people's drawing that have been shared in the app. My kids really liked this idea of seeing a drawing come to life in our home, that someone else drew! When you create an account you can save your drawings and then draw them again and again and again. The robot arm introduces the concept of robots doing the work. So if you want to send out 10 party invitations with an illustration you've hand-drawn - a robot arm becomes useful. You can change the size of your drawing and by repositioning the arm you could make a cool pattern for a notebook cover or wrapping paper. A robot drawing arm is also very useful when you've written a book with someone else and you don't see each other in person regularly enough to sign books for customers. 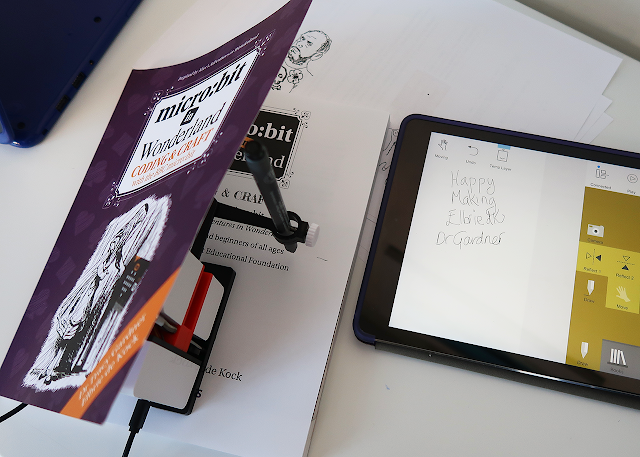 We've used Line-us to help sign microbit in Wonderland and think it's a very quirky way of getting the job done. Thanks Line-us! Line-us could also be used to design modern versions of games, like Pictionary. Can your team member guess what you drew in the app, before Line-us finishes the drawing? Use a timer and decide on a point system and you have a fun party game to share with friends or after a dinner party. We were originally attracted to Line-us in the Kickstarter as they said you'd be able to code the robot drawing arm using Scratch. So far there's documentation available for an API guide and python programming. We'll explore this in another post. So far we've enjoyed using Line-us. It's compact and once set up on the WiFi, really easy to use. The kids have enjoyed seeing their drawings come to life. The drawings are not perfect, but that is what makes Line-us fun. It's also great for experimenting. We've tried different pens and nib sizes and drawing with Line-us in the horizontal and vertical position. It's been fun seeing this little robot drawing arm come to life, through the Kickstarter campaign and we will continue to follow it's development. Line-us will be available from the Line-us online shop.